American Airlines, online at aa.com, is your source for travel. American Airlines offers airline ticketing along with plenty of other services for you trip. On American Airlines you can find affordable flights to all over the world. You can even book hotels, car rentals, cruises, and more with American Airlines. They are committed to providing you with reliable reservations to make your trip as easy and affordable as possible. So when you are planning your next travels be sure to checkout the flights at American Airlines to see what they have for you. But first, stop by RetailSteal for the best American Airlines coupon codes, American Airlines promotions, and American Airlines discounts. Shipping and handling rates do not apply to the services offered by American Airlines. Sign up for an American Airlines Membership to earn up to $100 in credit and 4000 flyer miles. At American Airlines, find flights to China and Japan on sale now for a limited time only. For a limited time only find American Airline Mexico fares for as low as $151. Click to save. Find romantic getaways for 2 on American Airlines to share a trip with that special someone for less. 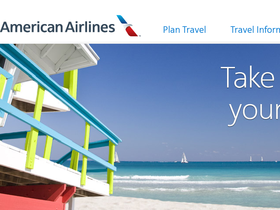 For a limited time only find Caribbean flights on American Airlines starting as low as $560. Click to save. To receive a $300 per booking discount, purchase a flight + five-night or longer hotel package to Liberia, Costa Rica with American Airlines and enter this coupon code. Use this coupon code on American Airlines to save $300 on your Steamboat Springs booking. Click to save. Visit aavacations.com and save 35% on Avis car rentals at any airport location. Use this code to save.